Tom Ebert dealt five scoreless innings, the Red Sox broke a scoreless tie with four runs in the last of the fifth, and Salem experienced the catharsis of victory for the first time in 10 days, downing Myrtle Beach 7-0 on Tuesday afternoon at LewisGale Field. The win snaps Salem’s excruciating six-game skid, in which all the setbacks were decided by three runs or less. But the Sox pitchers held the Pelicans to four hits on Tuesday while Salem capitalized on three Myrtle Beach errors to win at home for the first time in June. Ebert went a season-high five innings in his spot start for the Sox, surrendering just one hit and one walk. The righthander retired 11 of the final 12 men he faced after a one-out walk in the second, holding the high-octane Pelican offense to zero production. Ebert improved to 3-3 as the Red Sox bullpen carried the baton to the finish line, with Jeremiah Bayer tossing three scoreless frames before Will Latimer handled a perfect ninth inning. It was the fourth time in 2011 that Salem held its foe without a run, but just the first occasion since May 21 in Winston-Salem. Offensively, Salem mustered little off Pelican starter Wilfredo Boscan over the first four innings, managing just two hits through four as Boscan delivered dueling zeroes with Ebert. In the fifth, however, Zach Gentile led off with a single and the rally began. Josue Peley singled Gentile to second, and the Sox scored their first run when Pelican third-baseman Mitch Hilligoss fielded Derrik Gibson’s bunt and tossed it wildly down the right field line. Up 1-0, the Sox scored again on Wilfred Pichardo’s sac fly to center. Ryan Strausborger’s throw to third was mishandled by Hilligoss, allowing Gibson to follow Peley across the plate and give Salem a 3-0 edge. Salem’s fourth run crossed on Myrtle’s third error of the frame, with David Mailman singling to the deep hole at short and Leury Garcia bouncing the ensuing toss past first-baseman Chris McGuinness. Vitek, who has been hit by a pitch and then stole second, easily galloped home to make it 4-0. Two innings later, Pelican reliever Kasey Kiker allowed back-to-back RBI doubles from Mailman and Miles Head added a pair to Salem’s advantage. After being promoted from Greenville on Monday night, Head went 1-3 with an RBI double and a walk in his Carolina League debut, batting fifth and wearing #36. Head was being interviewed after the game by a crew from Comcast SportsNet in Boston when teammate Bryce Brentz drilled him in the side of the head with a shaving cream pie, providing an memorable yet sloppy conclusion to a very smooth debut. The Sox scrapped another run off the Pelican bullpen in the last of the eighth, with Pichardo doubling home Gibson for his second RBI of the day off Myrtle Beach reliever Ryan Kelly. Pichardo finished with one hit, two sacrifices, and two RBI, while Mailman led the squad with three hits from the cleanup spot. 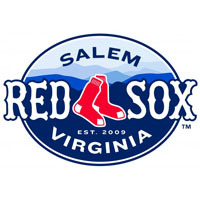 Half of Salem’s eight hits were doubles, and Salem won for just the second time at home since May 7. After beginning the season 13-5 at Lewis-Gale Field, the Sox had been 1-19 in the last 20 before Tuesday’s satisfying shutout. The lone bad news from Tuesday afternoon was the injury to center-fielder Peter Hissey, who fell down while making a grab in the top of the third inning. Hissey needed to be helped off the field by Manager Bruce Crabbe and Athletic Trainer Brandon Henry, a disappointing sight especially since Hissey was in the lineup for the first time in over two weeks, making his return from an oblique strain. Salem ventures back on the road to conclude June and commence July, journeying to Wilmington and Winston-Salem over the next seven days. The Red Sox and Blue Rocks will kick off a three-game set on Wednesday, with Pete Ruiz and Noel Arguelles the scheduled pitching matchup. First pitch is set for 7:05 at Frawley Stadium.